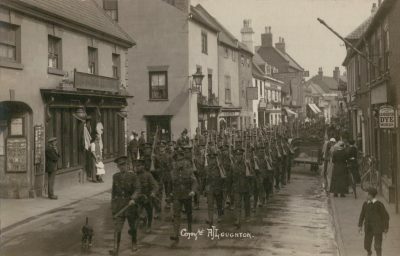 A selection of photographs featuring army personnel; scenes probably found in most towns and cities during the Great War. 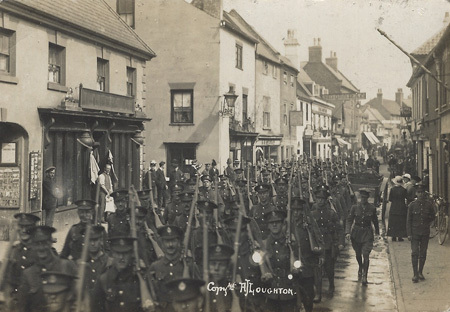 The Army marches past Manchester House, the drapers shop which belonged to William Loughton, Alfred’s brother. William can be seen standing outside the shop watching the parade go by with his daughter, Annie Mary “Queenie”. On the back of the photo it's written "Dad & Queenie at our shop". On the left can be seen the passageway to Alfred’s house and workshops. Note Alfred’s postcards on display on the wall. 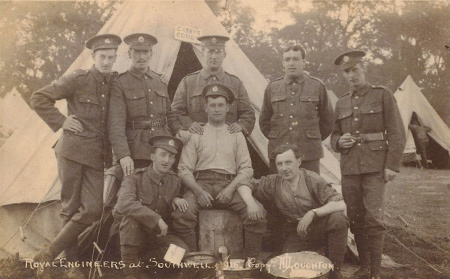 I suspect that this may be C company of the 4th Battalion Notts Volunteer Regiment. Maybe somebody can confirm this. A second shot of the above scene taken just a few seconds later. 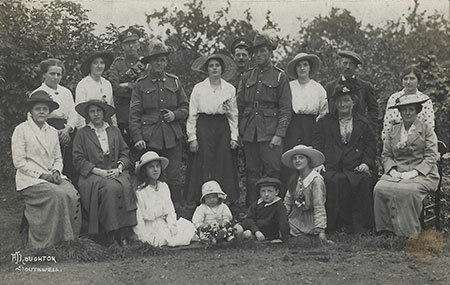 Two Australian soldiers posse with two other soliders and a group of women and children in what looks like an orchard. 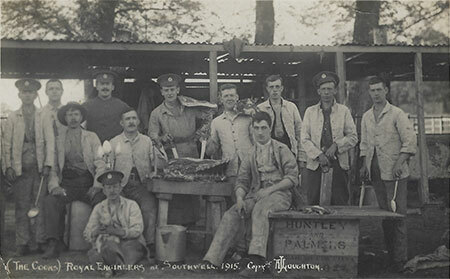 Cooks of the Royal Engineers posse with a large slab of meat. Royal Engineers posse outside a tent with the sign Casey's Court (a place with lots of frantic coming and going). Thank you to Shane Petterd from New Zealand who kindly supplied the photo. Shane's Great Grandfather, Thomas Kirby, served as a cook during WW1 and the photo was passed down through the family in a photo album. It is not know if Thomas features in the photo. 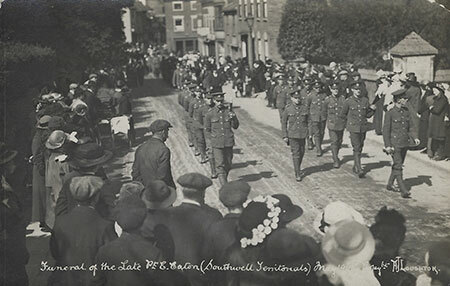 A large turnout of mourners for the funeral of Pte Ezekiel Eaton of the Southwell who died of wounds at Lincoln hospital 17 May 1915 aged 21. He was buried in the Minster grounds 'North of main West path'. He was the son of Ezekiel and Clara Eaton and the brother of Rose and Thomas Eaton. In 1911 they lived at Concert Hall Yard, Southwell, Nottinghamshire. He worked as a Lace hand at E Carey & Sons and enlisted at Southwell into the 1/8th Bn Sherwood Foresters (Notts & Derby Regiment).